Ames, IA and Seattle, WA: On Monday February 15th, Iowa State University graduate students will deliver 57,309 petition signatures to the College of Agriculture and Life Sciences at ISU while AGRA Watch members deliver the same petition to the headquarters of the Bill and Melinda Gates Foundation in Seattle, Washington. (The petitions will be delivered at 9:30am PST and 11:30am CST.) 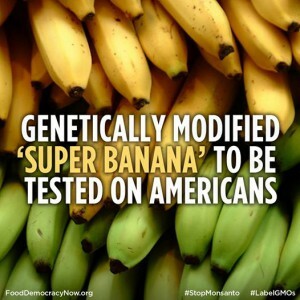 The petition asks the University and the Gates Foundation to cease supporting the transgenic banana study, including human feeding trials, and to change the trajectory for this type of research conducted at public universities. Petition signatures were collected by ISU graduate students, AGRA Watch and CREDO Action. With the purported goal of reducing Vitamin A deficiency in Uganda and other parts of the world, genetically modified bananas are enriched with beta carotene. The study examines the extent to which the bananas’ beta carotene is converted to Vitamin A in the body and absorbed by consumers. The study is funded by the Gates Foundation. The CREDO petition is a follow-up to a petition launched in 2015 by ISU graduate students who, in partnership with AGRA Watch, collected over 1000 signatures, that were delivered in December. These petitions respond to an email that was sent to the ISU student body in April 2014 inviting young women (ages 18-40) to eat genetically modified bananas in return for $900. This study is one of the first human feeding trials of a genetically modified product, and there has been no prior animal testing of this product. Thus, ISU students are being asked to be the first to consume a product of unknown safety. The study is not being conducted in a transparent manner, and concerned ISU community members have not been able to receive answers about the research design, risks, nature of the informed consent given by the subjects, and the generalizability of the study. Beyond the possible harm to students, the banana may have negative long-term impacts on Ugandan agriculture. Many banana varieties serves as staples in Ugandan diets. Ugandans have the right to have access to safe, nutritious, and culturally appropriate food. A coalition of over 100 U.S., African and international organizations expressed concerns in an Open Letter that genetically-modified bananas are not meant to serve such a purpose, and that this crop will have an adverse affect on Ugandan agriculture, food security and food sovereignty. The demonstrations come on the heels of a widely-reported new critique of the Gates Foundation, commissioned by UK-based Global Justice Now. In the reportentitled “Gated Development”, the organization argues that “big business is directly benefitting, in particular in the fields of agriculture and health, as a result of the foundation’s activities.” The report goes on to claim that the foundation creates “a corporate merry-go-round where the [foundation] consistently acts in the interests of corporations”.